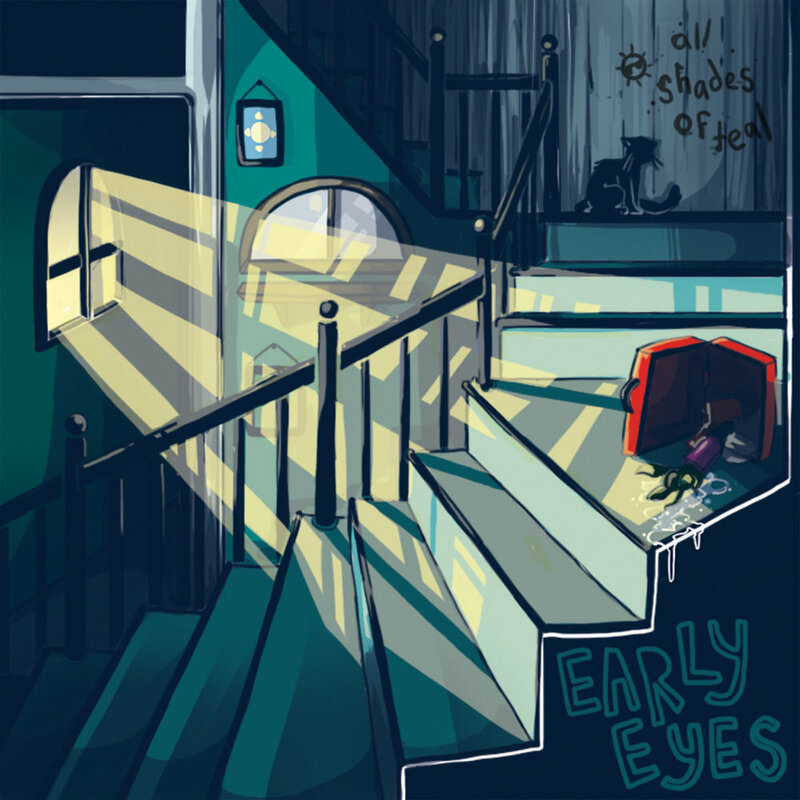 Early Eyes is a funky indie band that hails from Minnesota. With two dazzling EP’s already under their belt, the band is back for more. Their new EP, “All Shades of Teal,” encompasses love, self-identity, and seasonal themes. The first track on the EP, “Apple Cider,” is the perfect fall tune, with its cozy imagery and bold guitar. The opening line, “finding space to be kinder” really sets the tone for the entire EP. There are so many elements to this song, it is quite adventurous for Early Eyes to take on. However, each little element feels like a puzzle piece that when put together create this wonderfully poppy song. I cannot stop talking about “Case for You.” The song debuted as a single just before the full EP and features R&B artist, Dizzy Fae. The vocal dynamic between Jake Berglove and Dizzy Fae is unmatched. The bass is the star of the entire song, which is not uncommon for Early Eye’s music (shoutout to bass player Des Lawrence, you rock). “Holding Hands” was written with all the innocence of a first love. When I listen to this song I just want to sway around my kitchen while screaming the lyrics at the top of my lungs. The guitar solo reminds me of something found on an old John Mayer album, it is so beautiful and meticulous. The strings and back up vocals, sung by Lydia Liza, add so much depth to the song. The tune is basically like a musical pool and I’m ready to dive right in. “Shake Me Awake” is the most well written song about not knowing the right words to say. The line, “words are too small for what your worth when night falls” encompasses all of my feelings about this song. It’s such a perfectly catchy song with some of the best vocal moments of the entire EP. “Patternless” is the longest track on the EP and it is the soundtrack to your rainy autumn days. Although the beginning is quite mellow, the song picks up considerably when Berglove starts to sing. The song is lyrically very mature, but the clapping patterns remind me of childhood games which provides a nice nostalgic vibe throughout the tune. The closing track’s most gripping line has to be: “A lot happens between now and someday.” Each line of the tune’s simply stated lyrics pack quite the punch. Early Eyes released a lyric video for each song on the EP on their Youtube channel. These are the first lyric videos I’ve ever recommended for anyone to watch, but they pair so perfectly with their featured songs that it is an absolute must. The simple clips presented in the videos will get anyone into the autumnal mood. With all of the incredibly intricate songs they have released thus far, I cannot wait for Early Eyes to release their first full length album. Honestly if you have sixteen minutes free, just blast “All Shades of Teal” because it is a masterpiece.